The climate has suddenly decided to stop throwing 9C days at us, which means that the garden is growing into a jungle. The delay with the set up of the garden has been securing mulch. I’ve been after straw but unable to find any nearby. Those days are over. What I had thought inappropriate but what is available is cedar mulch. I had been concerned that it would be mildly toxic to the plants and would create acidic conditions. Research from the University of Missouri allays those fears. Most people have a vague feeling that, since cedar tends to repel insects and resist rotting, it is toxic to plants. While there is some evidence that cedar heartwood inhibits seed germination, there is not much information available on the effects of the same material on plants that are mulched with it. A few years ago, I got tired of shrugging my shoulders when asked the cedar mulch question and did a little research on the matter. [B]ased on this small test, it would appear that ground cedar wood is not toxic to plants when used as a mulch. Even though straight extract and 1:1 dilution retarded the germination of tomato seeds, there was no apparent permanent damage. Furthermore, it seems unlikely that the concentrations of potential plant growth inhibiting substances in the soil under cedar wood mulch would ever approach those in the 24-hour water extract. Materials leaching gradually into the soil from the mulch would probably be broken down by microorganisms before they could build up to high levels. Most people have the idea that mulches tend to reduce the pH of the underlying soil. While this may be the case for certain types of mulch, most studies have found that mulching has little influence on pH. The theoretical basis for predicting a mulch-induced pH decline is that organic mulches tend to increase the organic matter content of the soil and decomposition of soil organic matter releases organic acids. 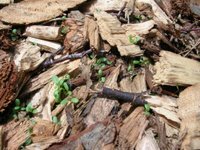 However, certain mulches have fairly high concentrations of calcium and potassium and when they decompose, these minerals are left behind, increasing soil pH in a manner similar to the minerals in wood ashes. In an Iowa study comparing the effects of various mulches on soil properties and on growth of maple trees, Jeff Iles and Michael Dosmann reported that the pH of the soil under hardwood bark (6.8), pine bark (6.1) and wood chips (6.4) was higher after 2 years than that in unmulched control plots (5.9). Duryea et al., reported a slight decrease in pH in response to mulching with pine needles, but little or no effect of pine bark, ground yard waste or cypress mulch. Results of a study in Connecticut examining effects of soil amendment with high volumes of leaves will surprise most people. Abigail Maynard, with the Connecticut Agricultural Experiment Station at New Haven found that the pH of soil amended with 50 tons per acre of leaves for 3 years increased from 5.4 to 5.7. While fresh oak sawdust may have a pH as low as 3.5, I found that a 3-inch-deep layer had no measurable effect on soil pH whether used as a mulch or tilled in. This was probably due to the relatively small amount of total acidity in the material relative to the buffering capacity of the soil. With mulch stored in large piles, anaerobic breakdown can occur causing “sour” mulch with a vinegar, sulfur, or silage smell. Such mulch can have a pH of 3.6 to 1.8, which can kill plants.